All the islands of Hawaii hold places of deep spirit and meaning. Today I’m paying my respects to three on the Big Island, each with its own strong sense of mana, spiritual energy. 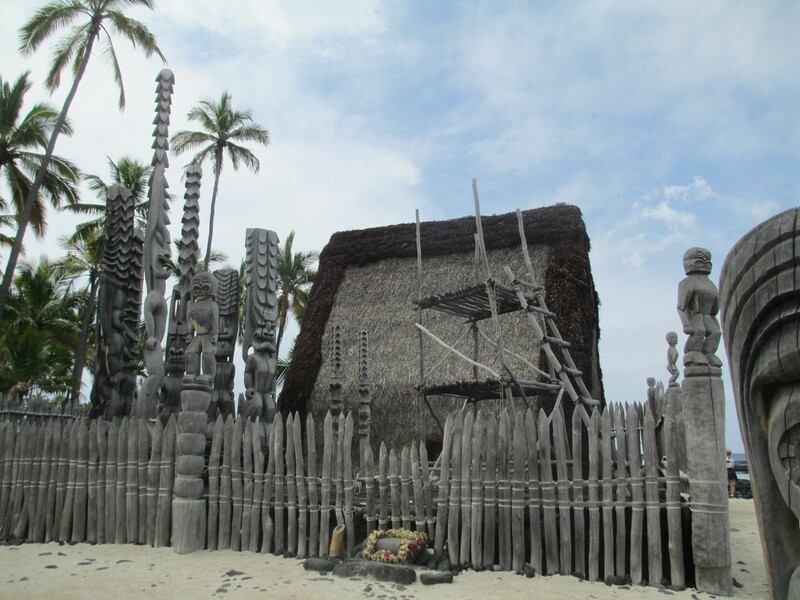 First, the Place of Refuge, Pu’uhonua o Honaunau, a 180-acre National Historical Park on the southern Kona coast. For centuries this complex of stone walls, thatch-roofed shelters, and ponds at the edge of the ocean was a sacred heiau/temple, home of royalty, and a place of safety—at least, for those who could get here. Standing next to a fearsomely carved figure, gazing at the surf, I’m imagining the relief I’d feel if I had managed to elude capture, get to this shore, and crawl up the rocks to sanctuary. If I’d broken a sacred law, a kapu —and there were a lot of them, from standing on a chief’s shadow to fishing at the wrong time—I would likely be killed, unless I got to this refuge. Then I could be absolved by the priests and return home safely. Different times, different customs. Today the only ones seeking refuge are tourists looking for shade under the palm trees. As I touch the massive stone wall, feel the gaze of the grim-faced wooden guardians, and place a hand in a carved stone bowl, I can sense those spirits of the past. Local craftsmen bring part of that past into the present day with cultural demonstrations—like Charlie Grace, a skilled carver of canoes and implements, who’s showing us how a fish hook was made from pig bone, and the way a stone-and-shell drill was used. 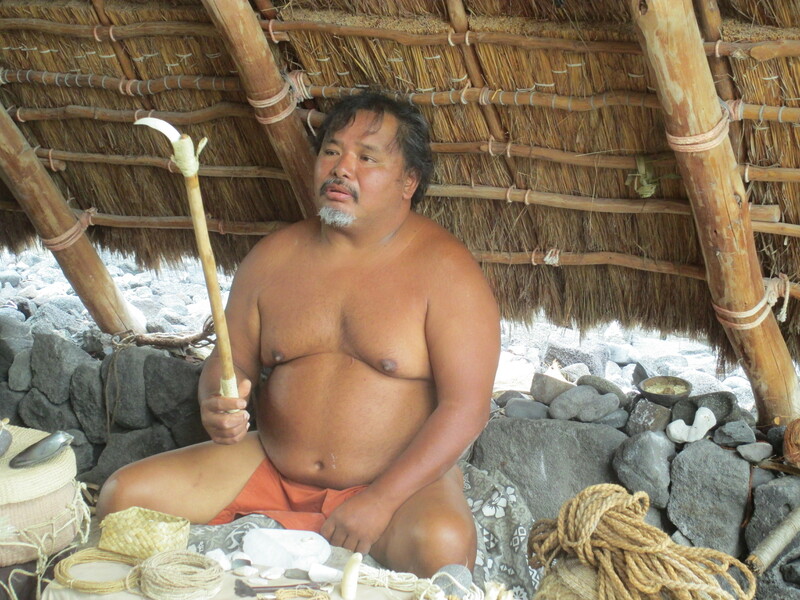 He “talks story,” too, in traditional Hawaiian style, telling of the ancestors, reverence for the land, and the great canoe that is our planet. 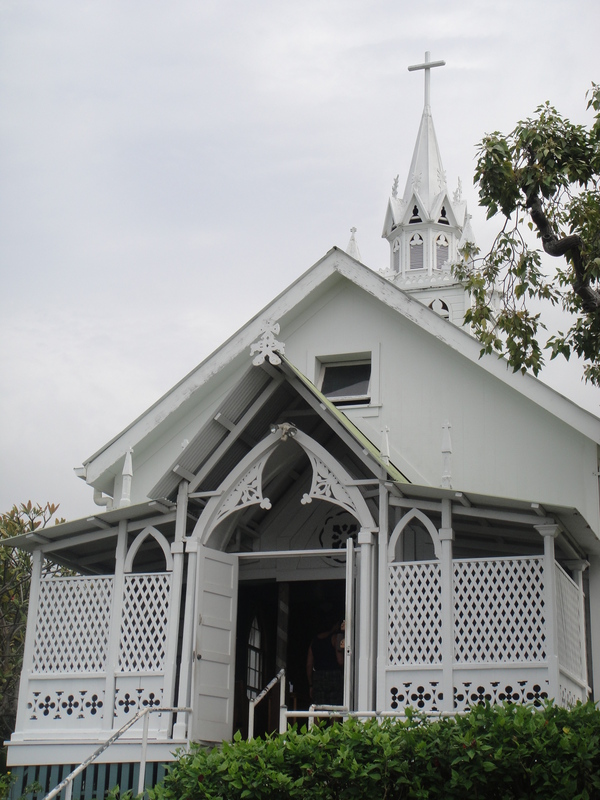 Another sacred place with a different tradition, up the Mauna Loa mountain slope on Painted Church Road, is a small, white, steepled church. 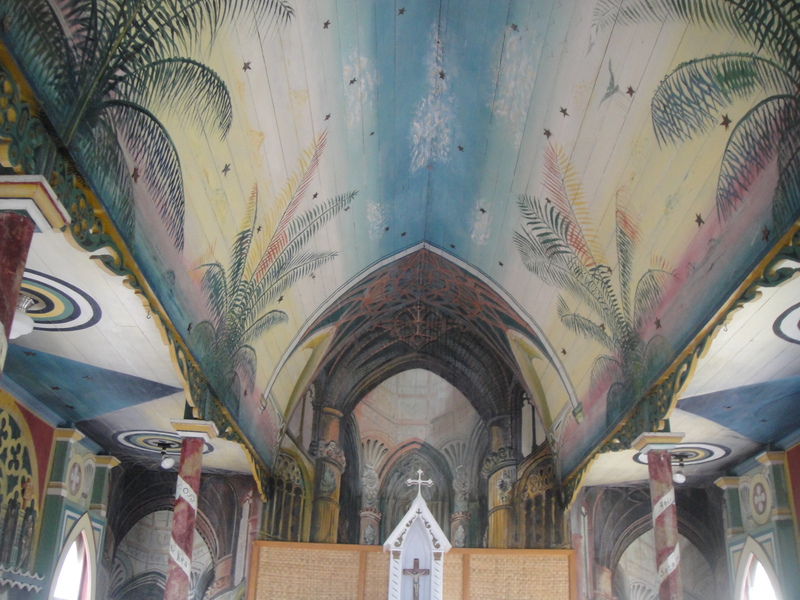 St. Benedict’s Painted Church, built in 1899, is an active local parish, but the main reason tourists stop by is to see the unusual interior, every inch of it covered with colorful designs. Father John Velghe, who came from Belgium, had no artistic training, but he used art to teach his faith to people who couldn’t read. 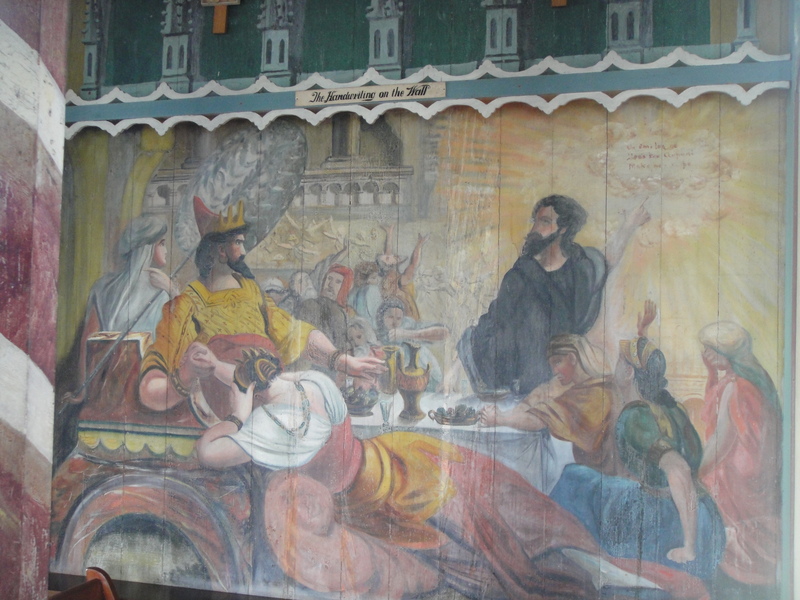 Using house paint, he painted illustrations directly on the church’s wooden walls and ceiling. Some have faded over time, but the Biblical scenes, palm trees, moral lessons, and decorative stripes are all here, the results of one man’s vision. Further along Painted Church Road, I find and enter the third and most recent sacred site, Paleaku Gardens Peace Sanctuary. It’s hard to describe just how special this serene, meditative, 7-acre garden really is. It started 44 years ago, with Barbara DeFranco’s goal of creating a spiritual center featuring world faiths and plants. With a lot of hard work and help from people who shared her appreciation of diversity, she reached that goal, although, she says, it’s always a work in progress. 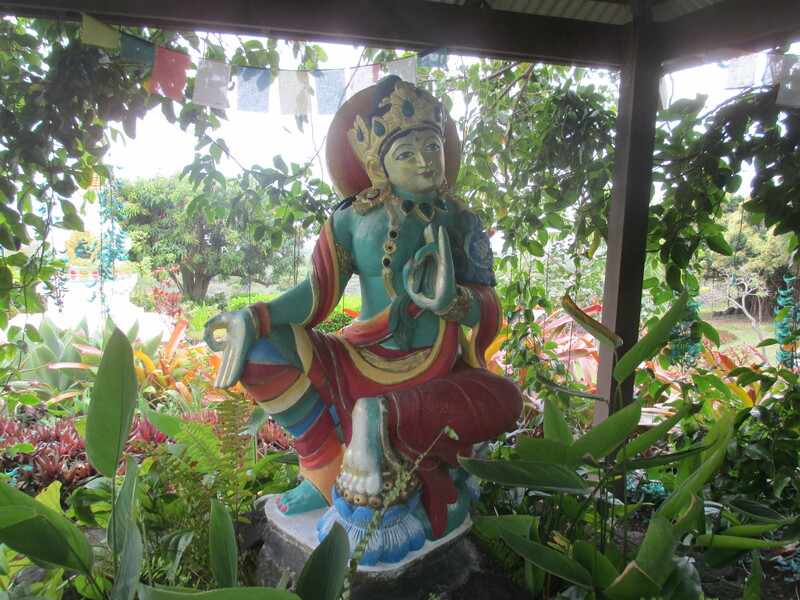 Wandering around the mountainside garden, admiring the views, I come to one shrine after another on the grassy slopes and set amongst trees and flowers of Hawaii and other parts of the world. 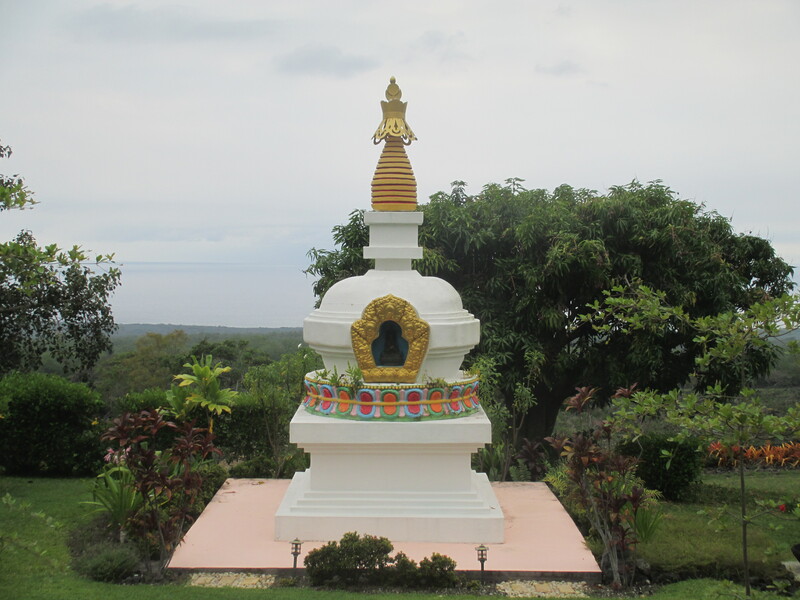 Buddhism, Christianity, Hinduism, Islam, Judaism, Native American and Native Hawaiian are here, along with Tibetan sand mandalas, a labyrinth, and even a 100-foot-diameter Galaxy Garden that shows the Milky Way in flowers. And those are only a few of the marvels of Paleaku. 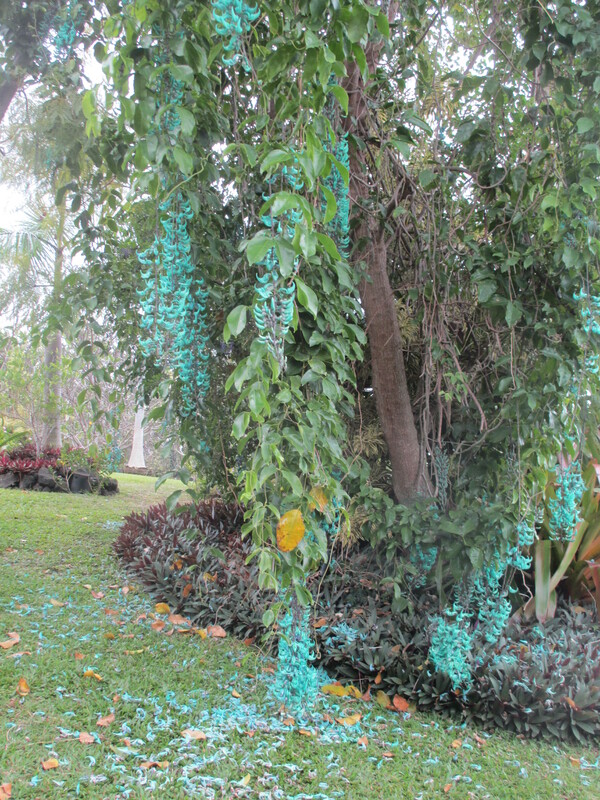 The sanctuary is not generally well-known to tourists and not to be missed. It’s open Tuesday-Saturday, 10 am-4 pm.